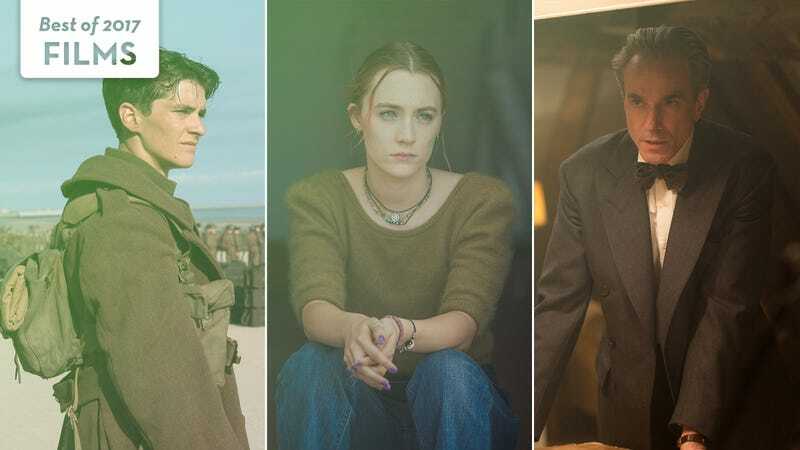 Dunkirk (Photo: Warner Bros.), Lady Bird (Photo: A24), and Phantom Thread (Photo: Focus Features). Graphic: Libby McGuire. 2017 didn’t improve much on 2016. If anything, the horror and dread of last year only seemed to take root and blossom this year, as some of our worst collective fears were realized and the future seemed to grow dimmer with every bad-news bulletin and misjudged tweet. If there was a constant, at least for cinephiles, it lay with the movies. One can quibble with the cumulative quality of 12 months of cinema. (Did this year produce a Moonlight or a Manchester By The Sea, a near-consensus masterpiece?) But as the world burned, the films still delivered. There were so many good ones in 2017, in fact, that we surely left out some of your favorites, including (spoilers for the few who have opted to read this preamble before scrolling through the selections below) The Shape Of Water, Blade Runner 2049, The Post, Faces Places, Wonder Woman, The Disaster Artist, Coco, and Mudbound. Chalk the omissions up to the particular tastes of our six regular contributors, and check out the individual ballots for a sense of whom to blame specifically for them. Hopefully, 2018 will improve on 2017 in almost every regard. But we really couldn’t ask for much better movies.